Just a very quick post today (since I blogged once already this week already) about my Character Education system. At the start of each month we talk about what the word means and share examples of how we, or someone we know, has exhibited that behavior. At the end of each week we debrief about who we have seen exhibiting this behavior. And for anyone who is not exhibiting this behavior (or exhibiting behaviors to the contrary) I give them a checklist of specific ways they can improve for the following week. 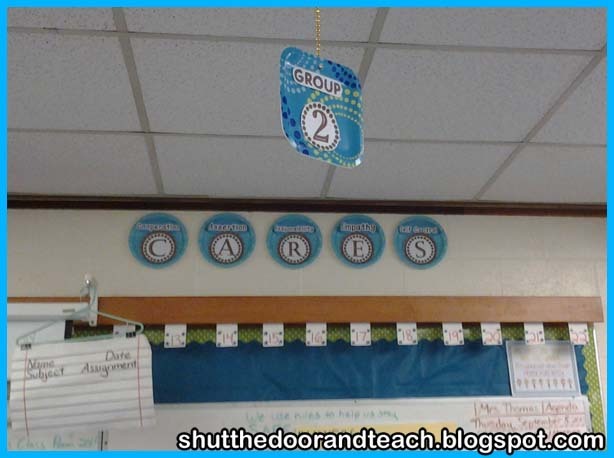 In the past I had a small poster with the CARES acronym but this year I wanted to make it stand out more. To make my character education banner, I coordinated the design that I used for the table numbers and birthday pencils. The fonts I used are all free fonts, and the blue backgrounds are simply paper plates! I saved a lot of ink using the plates instead of printing out bunting, which I originally planned to do (I already had lots of plates from when I'd found them on sale). They really stand out despite being really high up, but they coordinate with the colors and dots in my room. How do you display your character development expectations?